A Fremantlebiz memo to the future. Today is the 16th anniversary of the blog Fremantlebiz, which I originally started on the 17th of April 2004. 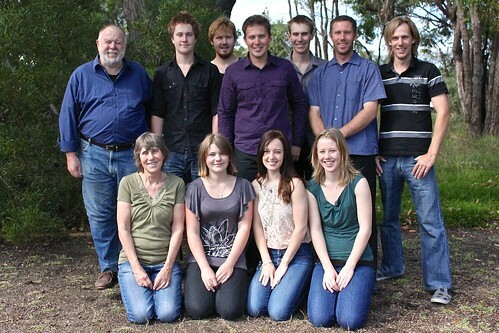 Since then all our nine children have grown up and produced seven grandchildren, with at least two more on the way. We have been truly blessed. We two oldsters have continued to grow older too. My darling wife Jill is a sprightly 65 and I will be 74 in a couple of weeks time. However my interest in maintaining the blog has lessened this year. My engagement with Parkinson's has meant that daily entries are a thing of the past. I now do about two short entries a month. In addition the primary reason for this demise are that family orientated interests outweigh everything else. Furthermore, the photo archives I established at Google and Flikr have become inaccessible and the Apple software on my ageing iMac is becoming increasingly redundant. The sobering lesson is that all such technology is an unreliable medium for preserving such stories for future generations. Luckily since inception I've ensured that all my blog entries have monthly been filed, indexed and converted to PDF, and I have created printouts of every one since the outset. That's something I guess. It would be nice to think that with so many descendants the literary effort might have a chance of survival. So I will for the time being continue as at present. COMMENTS: Because of an ongoing problem with spammers, all comments are now screened and can only be made by friended LiveJournal users. Click here to browse through the collection of free downloadable PDF versions of my many illustrated Rottnest Island essays. Last Saturday Jill and I attended a costume party to celebrate the thirtieth birthday of our twins Fiona and Dale. There were many zany family and friends present, all quite a bit younger than me. The catering was terrific and the company convivial. Many thanks to our eldest daughter's in-laws for being such gracious hosts. The end of March is fast approaching and this is only the second blog entry for this month. As autumn progresses the nights are getting cooler and our two sleeping cats on the end of our bed are getting heavier. Grand parenting duties keep us busy during the waking hours. Back from the south coast. Our dusty laundry is getting a going over from the washing machine following nearly a week of exploring some of our favourite haunts along the south coast of of our state. I am having trouble posting images from Flikr and am unsure if there is a solution. The end of February 2019. Jill and our grandson Levi. Here it is the end of February already and so be it. We've just about had enough of this summer. 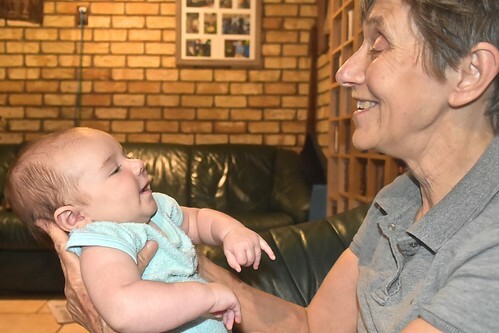 I took the photo of my darling wife Jill with our youngest grandchild Levi a couple of weeks ago. The 18th of the month to be precise. He's growing fast. A family day at a friend's farm. We spent a day at a farm. 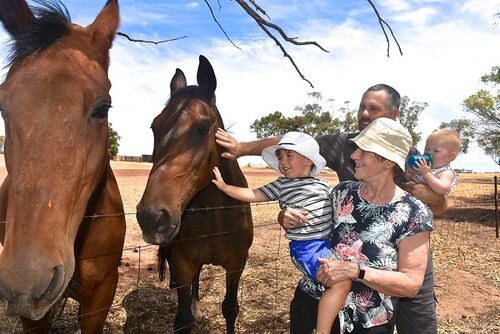 Jill and I visited a friend's farm in the wheatbelt near York yesterday with our eldest son Luke and his two children Jasper and Zoe. We all enjoyed our visit and meeting the two friendly farm horses whose names I've forgotten. A special Valentine family pic for 2019. Jill with our seven grandchildren and their mothers. Yesterday was Valentines Day and with lots of love in the air I had the rare opportunity to take the above photo of all seven of our grandchildren and their mothers with my darling wife Jill at the same time. COMMENTS:Because of an ongoing problem with spammers, all comments are now screened and can only be made by friended LiveJournal users. 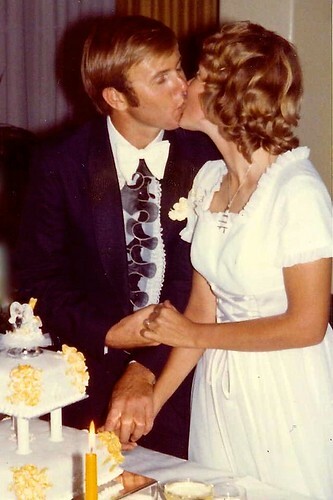 It was a warm and windy summer's day when Jill and I were married in Perth all those years ago in 1973. 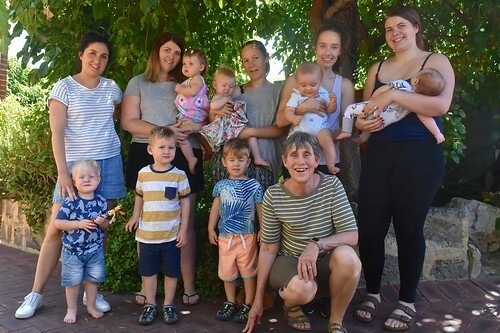 We never guessed that forty-six years on we would be the proud parents of nine beautiful children and seven grandchildren. I can confidently say that neither of us have had any regrets about sharing our lives together. We have been truly blessed. Thank you for everything my darling wife. I love you. COMMENTS: Because of an ongoing problem with spammers, all comments are now screened and can only be made by friended LiveJournal users. Alternatively, email me direct. Paul relaxing with Bubbles and Rodney. Wow, talk about summer relaxation. It's the end of January already and this is only the third entry for the blog this month. 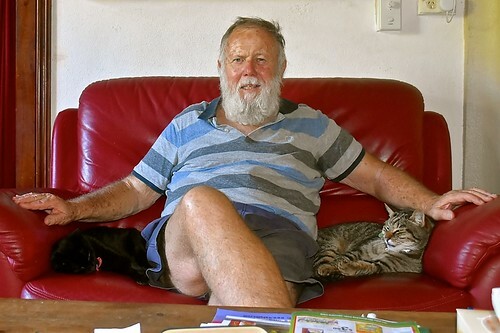 The photo of me with our two cats Rodney and Bubbles was taken last night by my darling wife Jill. I should have smiled more. The weather here in the Fremantle area is going the be fine and hot today. We need to water some of our ivy geraniums and a few tomato bushes before the sun gets too high. It has been a while since I posted an entry to Fremantlebiz. The beginning of this month in fact. The main excuse is slackness. I warned in an entry late last year that I would be posting less and less. The other excuse is that I am getting old and starting to feel it. I am sleeping in more while in the past I used to do most of my writing in the early mornings before anyone else in our household was awake. 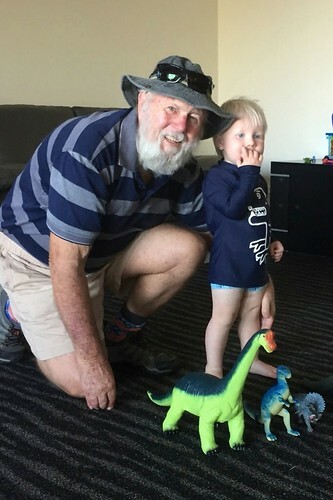 Anyway, the photo of me with my grandson Tate was taken at a second birthday party thrown by his parents for him yesterday. He's one of seven grandchildren which take priority over activities such as blogging. New Horizons continues to amaze. It's amazing to me that I first wrote about the adventures of the NASA spacecraft New Horizons in a 20 January 2016 blog entry 'Seeing is believing - the Pluto mission launched.' - https://fremantlebiz.livejournal.com/167564.htm - It took nine years to reach Pluto and beam back a wealth of scientific data and astonishingly clear images of the dwarf planet in a 15 July 2015 entry at: https://fremantlebiz.livejournal.com/1063579.html - Now thirteen years later it has done a close pass of a Kuiper Belt object named Ultima Thule and as with Pluto is sending back clear images of what appears to be a couple of conjoined icy spheres. But the some four billion miles adventure is not over for New Horizons. Over the next few years further exploration involving close passes of other Kuiper Belt objects at even greater distances is proposed. We are truly living in a 'golden age' of space exploration. As I wrote on 5 August 2005, I am reminded of when I actually saw the first Russian Sputnik in 1957 with my parents from the front lawn of their house in Attadale. My dad was even able to briefly pick up its beeping on a portable AM radio, which was almost miraculous considering the speed it was moving and the rapid doppler shift. In later years when I was an active radio ham I managed a radio contact with the shuttle Challenger, and I have the QSL confirmation card to prove it. One more sleep to 2019. Jill gave Millie a haircut on New Year's Eve. Here we are on New Year's Ever 2018. Tomorrow will be 2019. 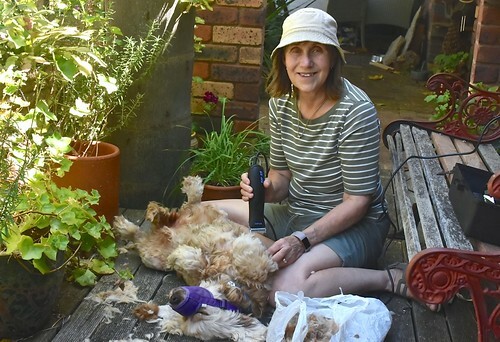 The photo is of my darling wife Jill giving our old dog Millie a summer haircut a few moments ago. We wish everyone we know a safe and happy new year. Christmas 2018 done and dusted. Jill & Paul Weaver's grandchildren, December 2018. It's two days since Christmas and my darling wife Jill and I have been very busy for several days helping our largish family wherever and whenever we can. Most of our family members enjoyed a bi-family Christmas lunch generously hosted by our son Tim and his wife Claire last Tuesday. Jill baked up a delicious vegetarian pie as a contribution. All of our seven grandchildren were there and rather naturally were the focus of attention. There were many presents for the kids, which included a trampoline, drum kit, tricycle, scooters and my personal favourite, some Matchbox Cars. The adults did okay too. Jill and I handed out nine snake-bite first-aid kits to each of our nine children which we hope they will never have to use. 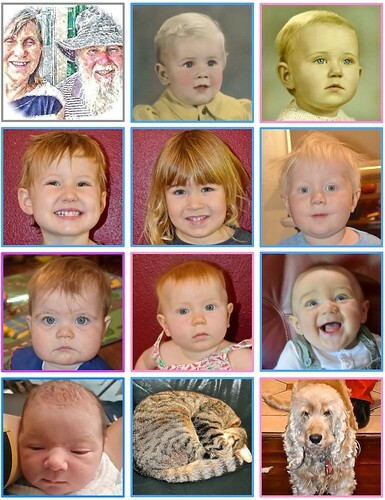 The photos are of Jill and I in the top row, followed by our seven grand-children underneath. Paul & Jill Weaver with new grandson Levi. 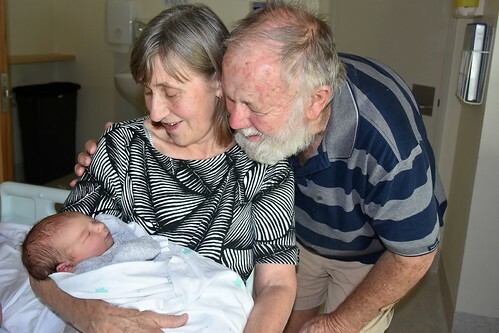 My darling wife Jill and I met our seventh grandson Levi for the first time yesterday afternoon. He's the first baby for our youngest daughter Kylie and her partner Jed. Like his six cousins Levi is a beautiful baby and is the fourth grandchild we've welcomed into our burgeoning family in 2018. It's all very exciting. Thanks to Jed for taking the photo of us two oldsters and Levi on my camera. The arrival of grandchild number seven. Exciting news today for our large family. It's congratulations for our youngest daughter Kylie and her partner Jed on the birth of their first baby Levi early this morning. Mother and son are both doing well. 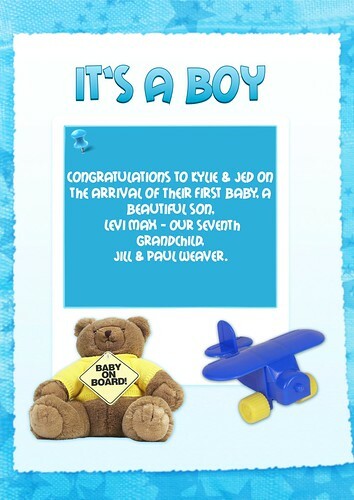 My darling wife Jill and I welcome the arrival of our seventh grandchild and look forward to meeting him soon. Jill is a Santa's helper when required. 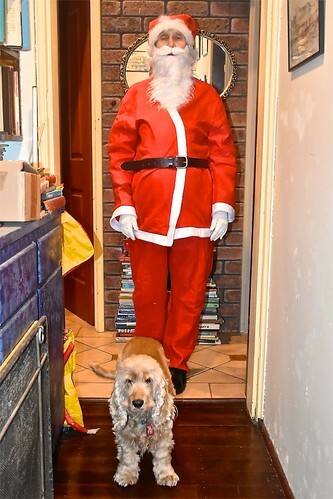 My darling wife Jill put up her hand when the call went out a week or so ago for a Santa's helper to liven up a dual-family Christmas lunch hosted yesterday by our son Ken and his darling wife Melanie. Unfortunately due to other commitments, a coordinated presence to ensure all our grandchildren were in the same place at the same time proved impractical, and meant the Santa idea was dropped. The photo is of Jill undergoing a dress rehearsal at our place earlier in the week. Even so, yesterday's event was very enjoyable and our thanks go to Ken, Melanie and everyone else who contributed what can only be described as cornucopia of delicious food. In the spirit of Christmas goodwill I even forgive the carnivores for insulting Jill's vegetarian Sausage rolls. Jill is in charge of Christmas in our house. Christmas falls during summer in Australia and so many of the traditional customs can seem out of place. But that doesn't prevent most of our large family from putting up decorative items in their homes such as plastic Christmas trees. The photo is of my darling wife Jill putting our effort together a week of so ago. We're getting ready for Christmas. Grandpa Paul Weaver & grandson Tate. Today is the end of November 2018 and so tomorrow the chocks will be well and truly off for the family countdown to Christmas. That's not to say that a countdown has already been ticking, if you know what I mean. 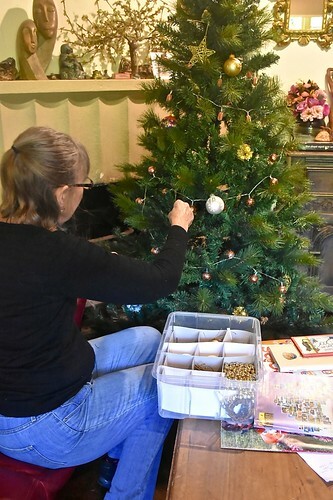 My darling wife Jill and our two cats unpacked and decorated our plastic Christmas tree early this week and she yesterday showed our visiting grandchildren how to make an Advent Santa out of craft materials. 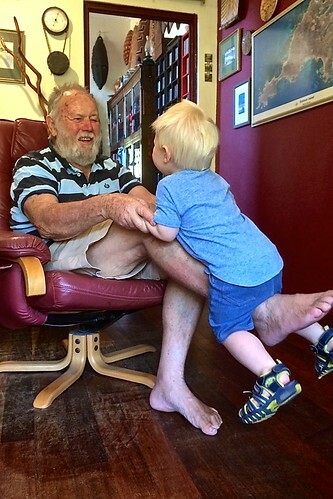 The photo is of one of our grandsons Tate getting a bounce on my leg just like all our own nine children used to get when they were his age. My old Applecross High School is 60. On Saturday afternoon two days ago my darling wife Jill and I attended an observance of the 60th year in the history of Applecross High School of which I was a foundation student. Starting at the beginning of 1958 I went there for three years until in November 1960 it was deemed I and most of the other students would be better off finishing with our schooling and trying our luck in the work force. I have a November 1960 certificate showing the subjects in my final year were English, History, Geography, Elementary Mathematics, Woodwork, Metalwork, Technical drawing and Physics. I redid English at night school in 1961 to complete my Junior Certificate issued by the University of Western Australia. There were eleven classes of baby-boomers that started at Applecross in 1958. Most of my friends had come through from Attadale Primary School where years earlier I was also a foundation student, but a few new friends came from other primary schools. I have since lost contact with most of them. In 1965, a few years after I left Applecross High I was conscripted into the Australian Army which translated with a year's active service in 1966-67 for the Vietnam War. Ironically I had not been allowed to join the Army cadet unit at high school because of my low grades. Another bit of irony came in the 1990s when I was awarded a BA with first class honours and later a PhD by Edith Cowan University. History and geography played a role in both awards. The motto of Applecross High School is "Achieve". Undoubtedly the greatest achievements in my life have been marrying my wife Jill and raising our brood of nine beautiful children. The photo was taken at Applecross in November 2011. Rodney relaxing on the couch. Over the years since before we were married Jill and I have each had many cats and dogs in our lives. For the most part they lived to ripe old ages, except for the ones which came to an untimely end because of misadventure. Without exception all of them had unique personalities. Currently we have two cats and a dog. All of them like to snooze on our leather couches. 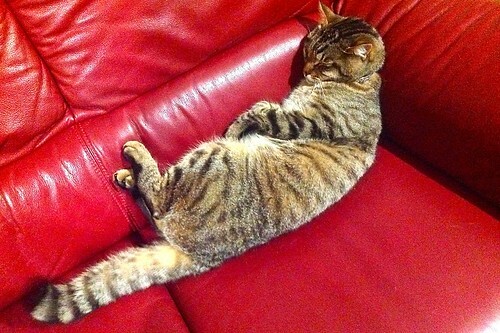 The youngest is our tabby cat Rodney whom I found with his feet up a couple of nights ago. He often likes to sleep in this position.